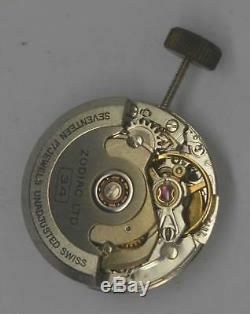 Vintage NOS ZODIAC 34 Movement. White, Silver, Champagne, Blue, Black, Green, Brown, Light Grey, Deep Grey, N/A. Does Not Change Date Disc. Does Not Change Day Disc. Can Be Used To Set The Hands. Runs For A While And Stops. Not Checked For Time Keeping. 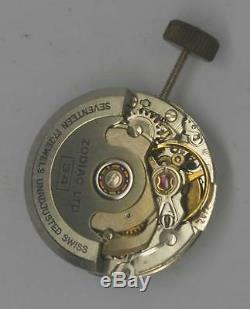 Balance Wheel Runs Freely When Shaken. Minor defects not mentioned in the condition outline but visible in the photos will be considered as described. Please review the photos carefully as they may give you a better idea of condition. All our merchandise are guaranteed original and authentic, except otherwise stated. The photos are taken from the actual items you are purchasing. 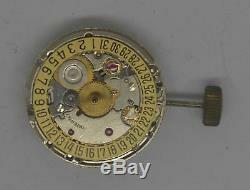 The item "Vintage NOS ZODIAC 34 Movement. Cal ETA-2671" is in sale since Thursday, July 12, 2018. 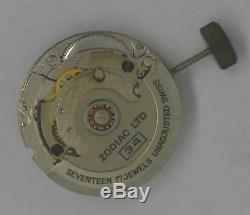 This item is in the category "Jewellery & Watches\Watches, Parts & Accessories\Parts, Tools & Guides\Watches for Parts". The seller is "fix-this-watch" and is located in London, LONDON. This item can be shipped worldwide.